Every morning, children at hundreds of Los Angeles schools start their day hungry, making it tough to learn much or to get through the morning without a trip to the nurse with headaches or belly pains. That doesn't happen at Rosencrans Elementary School in Compton, where breakfast is the first subject. At the start of school, children designated from each room come to the Rosencrans cafeteria to get a rolling cooler — filled one recent Wednesday with beef sausage on English muffins, milk and apples. "I like pulling the cart to deliver breakfast to the whole class," said Shawn Hansborough, 8. "The teacher told me I got to do it because someone else was being bad and I was being good." And getting more students to eat breakfast at school is a major goal of a new Share Our Strength campaign called No Kid Hungry, kicked off March 17 at another school, Figueroa Street Elementary in South Los Angeles, with a program that included U.S. Secretary of Agriculture Tom Vilsack, Mayor Antonio Villaraigosa, Food Network celebrity Guy Fieri, former L.A. Laker A.C. Green and Oscar-winning actor Jeff Bridges, as well as nonprofit and community leaders. Even with all that star power, it was a group of Figueroa students who got by far the loudest applause when they said the school's pledge, ending with a rousing "I do my BEST!" In L.A. County, more than 300,000 students who eat free or reduced-price school lunches don't eat school breakfasts, according to the California Food Policy Advocates. And about $1 billion in federal reimbursements is being "left on the table," Shore said. Rather than start new food programs, No Kid Hungry, with funding from the Wal-Mart Foundation, intends to help childcare centers and schools make better use of funds already available. The goal is to increase participation in school breakfast programs by 10% the first year. Under legislation signed in December by President Obama, school meals will have less sugar, fat and salt, and more whole grains and fruits and vegetables. Vilsack noted that the law also reduces the paperwork for certifying children as eligible for free or reduced-price meals. Bridges, spokesman for the national No Kid Hungry campaign, which has a goal of eliminating childhood hunger by 2015, called the level of hunger in the U.S. "insane. It's so clear it doesn't have to be that way." 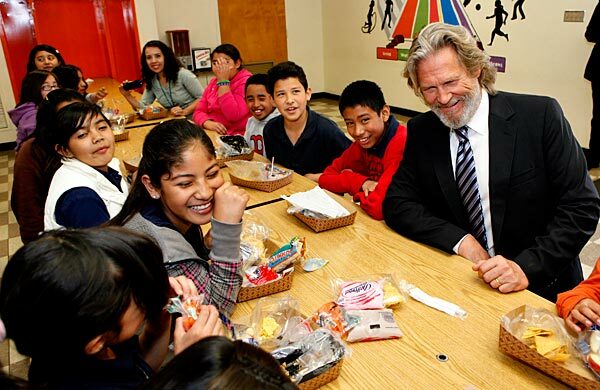 Bridges, who has been involved in anti-hunger programs since 1984, said he'd like to make a film documenting creative ways that schools all over the country are fighting hunger and serving meals. He said he'd also like to see children encircling the Capitol to issue a hunger report card to Congress. The California Food Policy Advocates and other groups have promoted breakfast in the classroom as a way to make sure everyone eats, because students who arrive just before the bell often miss out on breakfast served outside of class. Few California districts do it; officials say that teachers and staff are sometimes resistant, fearing a mess and a loss of instruction time. "The biggest hump for us is a series of perceptions about the barriers, but when people try it, they don't go back" to serving breakfast before school begins, said Josh Wachs, chief strategy officer at Share Our Strength. At present, about 200,000 LAUSD students, including preschoolers, eat school breakfast, said David Binkle, deputy food services director. For those who can pay, a school breakfast costs 60 cents for elementary school students and $1 in secondary school. About 80% of LAUSD students are eligible for free or reduced-price meals. At Rosencrans, "there's almost a complete turn-around" in detractors' opinion, said Cheryl Johnson, the district's facilitator for breakfast in the classroom. "It changes students' alertness; they're more positive. The time until lunch runs smoother." In the classrooms, students eat while they practice multiplication tables or the teacher makes announcements. Parent volunteers help younger children open milk cartons. "I like this time, like when you are at home eating with the family. It's an informal time to connect," said Teja Fields, a kindergarten teacher. She puts problems on the board for kids who want to do them. She said the meal takes 15 or 20 minutes. And more children are eating, Johnson said. Last October, about 110 at this school ate school breakfast; now the total is about 420, she said. Compton plans to have all 23 elementary schools taking part by summer, said Tracie Thomas, director of nutrition services. Vilsack said breakfast in the classroom is a good concept, but there are other strategies that work as well, such as serving breakfast between early periods or from carts with "grab-and-go" breakfasts. Opposition sometimes comes from people who say it's parents' responsibility to feed children before they leave home. But, says Norma Johnson, program specialist for breakfast in the classroom in the San Diego schools, with economic instability and the twin problems of obesity and hunger as well as a population of homeless children, "we have a lot of obligation."